Gold and Silver conjured a positive week on the parquet. But by the middle of the week a consolidation started of which I’d like to analyze the background and its probable course in this issue. 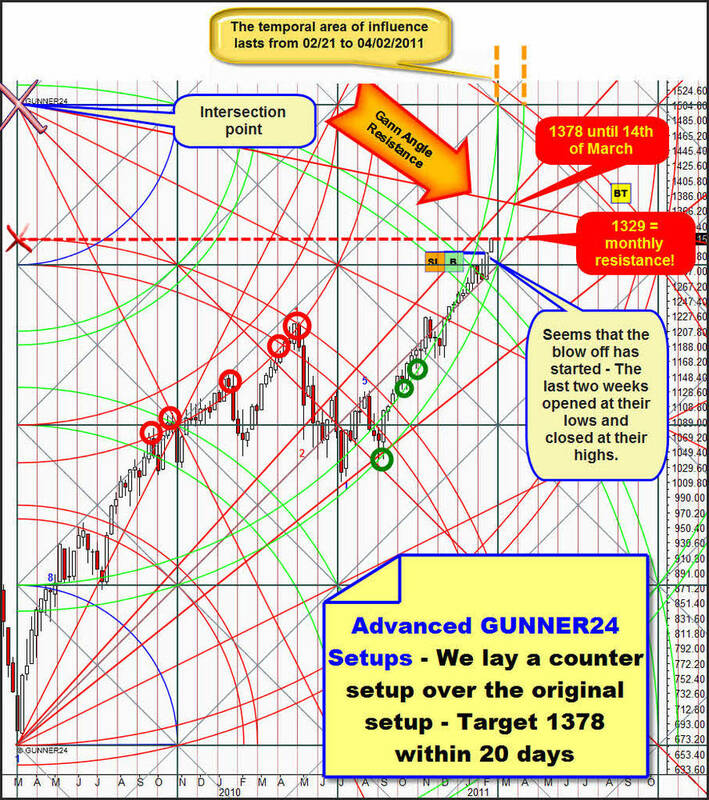 Furthermore I’ll try to demonstrate why really some consolidations use to occur in the markets at a certain moment and which way you can employ the GUNNER24 for learning to assess the consolidations in price and time. Well, the consolidations arise because something has happened in the past. It’s billions of past price margins (during a certain time the price moves by every so many points). In the past the masses of the market participants have voted by their feet, as it were, determining the future supports and resistances by the produced price margins. By the GUNNER24 Forecasting Systematics you’re able to measure the emerged price margins and to have point out the future effects which result from those margins – in price and time. It makes sense to analyze the environment of the important lows and highs because that’s where the important future developments are generated. About that you may work as well with an up setup as with a down setup. That technique opens new views and relatively secure future assessments and therefore relatively reliable trading signals. Let’s consider now the last significant gold low. We count an 8 candle initial impulse. This up setup is very valid because we can make out as early as at the beginning of this setup that the highs of the candles 8-10 can be linked. As I said, I consider a "perfect initial impulse" as valid. That means I’m very positive that the market is going to stick to the important future marks in price and time it defined in the price margins 1-10 being well depicted by GUNNER24. Let’s go now to the analysis of this setup: The structure of the last four candles is forming an explosive mixture. You can really see that the market is willing to rise. The blue arc is defining the tops of the candles 8, 9 and 10. Besides, there was an attempt to break that blue arc on Friday. But in spite of everything so far we can see a consolidation in the highs! Ancient rule: The consolidations at the highs break to the upside. The last downtrend is fighting with the new uptrend. Both are more or less equal. The new uptrend, released by the rebound from the 2nd double arc has kept going upwards during the last days. Important is this: Gold is being in the bullish part of the setup because it re-conquered the 1*1. Furthermore important: The new upswing will be ended by a closing price within the 2nd double arc, but not before. An explosive compression! Can you see why gold has to consolidate just right now? 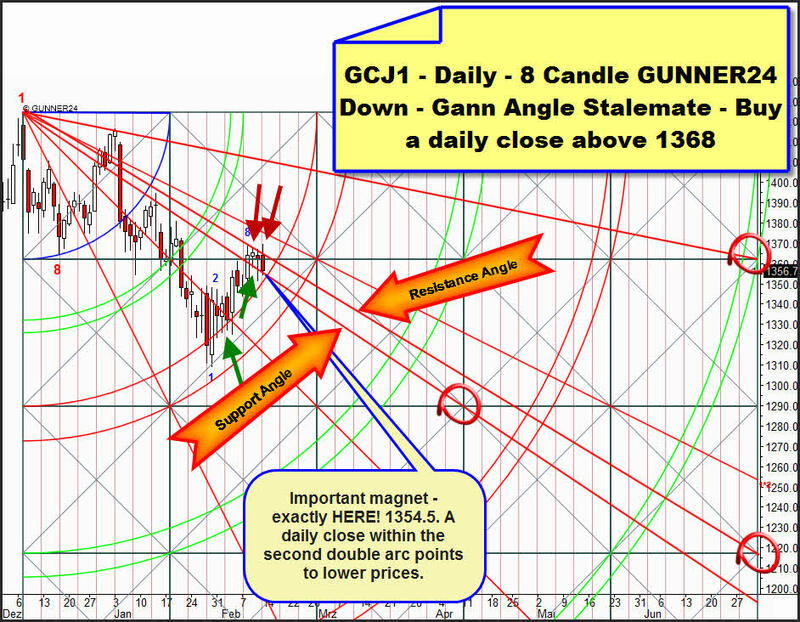 The support Gann Angle of the all-time high was re-conquered on Tuesday having been backing gold for three days. 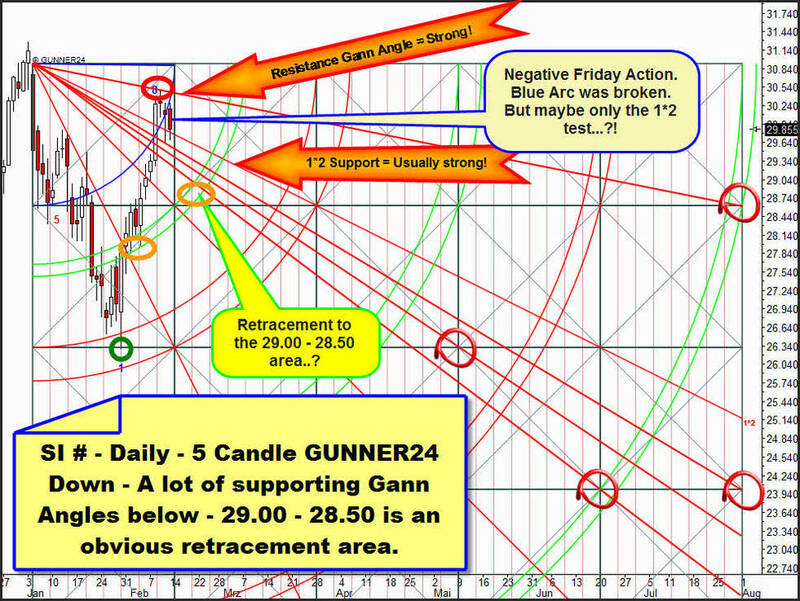 The resistance Gann Angle has been preventing the further rise for four days. An unambiguous stalemate is present. But on Monday/Tuesday a sign will come because from below the 2nd double arc is coming into play. We go on speculating on a break-out upwards buying a daily close of more than 1368 with target 1380. Rarely before I had seen such a tough fight as that one I saw in the silver pit last Friday. The bulls and the bears were slapping each other – it was a real joy watching it. The setup above is showing why things happened like that. With the 30.50 silver touched exactly the upper line of the main target again last week (right orange circle). During the last days a counter reaction to the 30.50 took place. 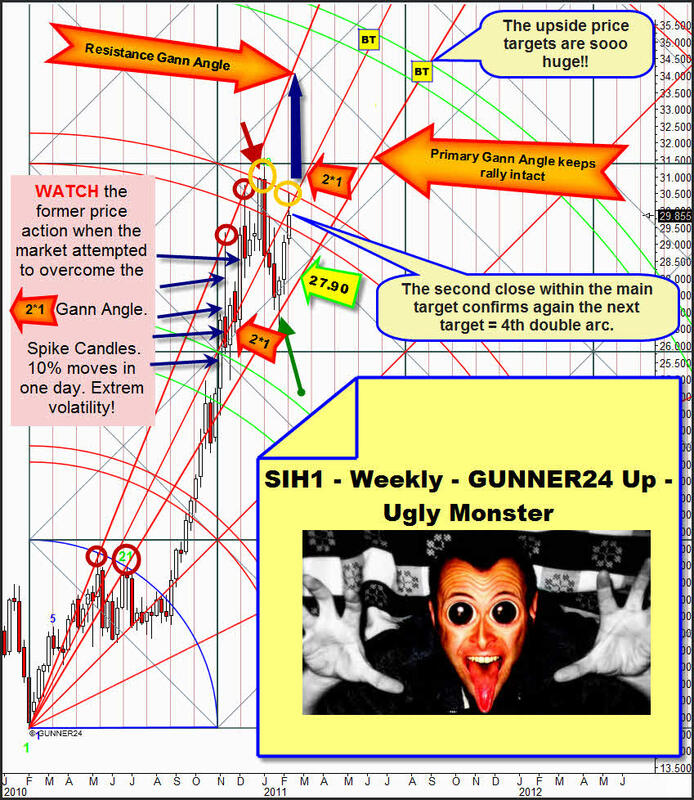 As we see, the week closing is below the 2*1 Gann Angle. But the closing price within the main target confirms at a 70% of probability that the 4th double arc in the direction of the trend will be reached. At least for one week the bears succeeded in keeping the market below that "nitro barrel". Nitro barrel? Pay attention about that to the note in the left margin of the setup. Here you can see what may happen when the market is getting to quote above the 2*1 and fighting for it. It’s a wild, volatile, ecstatic up and down. Get ready for such a price conduct if next week/the week after next the 3rd double arc and the 2*1 are broken! In that case it wouldn’t make any sense during the following weeks to set SLs, they would all be cleared away. 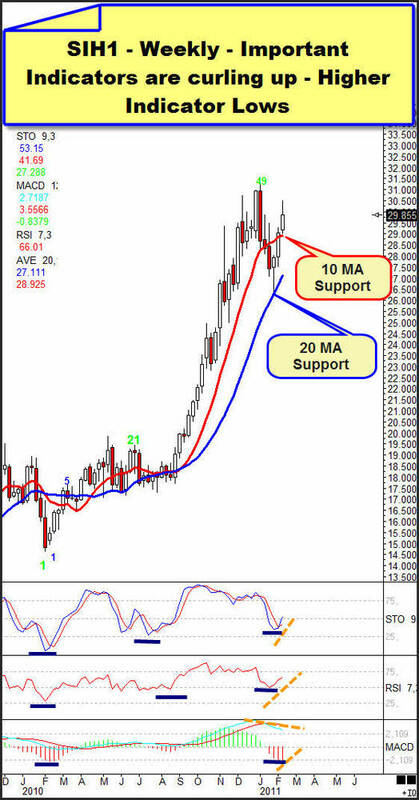 Besides, I think that silver should break the main target and the 2*1 sooner or later, that’s why in the GUNNER24 Gold Trader I recommended a long position with a few or a small leverage to be prepared. The targets in price and time will be breathtaking if the main target breaks (thick blue arrow). 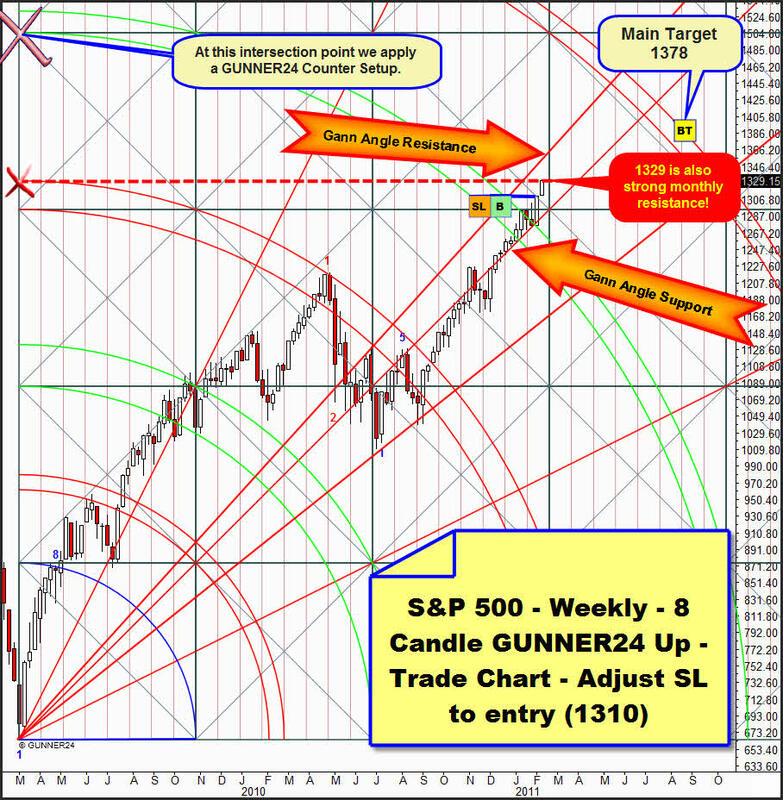 If the main target is broken there won’t be any reason why the resistance Gann Angle shouldn’t be resumed within a very short time! A price of just 30.51 will generate the forth higher high, in that case we will be able to assume at least a 5 week price rise. One reason for the long recommendation is on the one hand also the weekly indicator situation. The important indicators are putting out higher lows. The indicators themselves are all curling upwards having an enormous upwards potential altogether. Here again the stalemate in the daily time frame is to be seen. At short notice, on Friday the bears succeeded in generating a negative sign being broken downwards the blue arc. All the same the Friday low is lying above the Thursday one = positive. There’s no spike candle to be seen at the high = very positive. A logical cushion point for a possible correction is the green double arc at 29.00-28.50. But still everything is rather pointing to a breakout. The consolidation is taking place at the highs, as well! Below the price there are 4 (!) 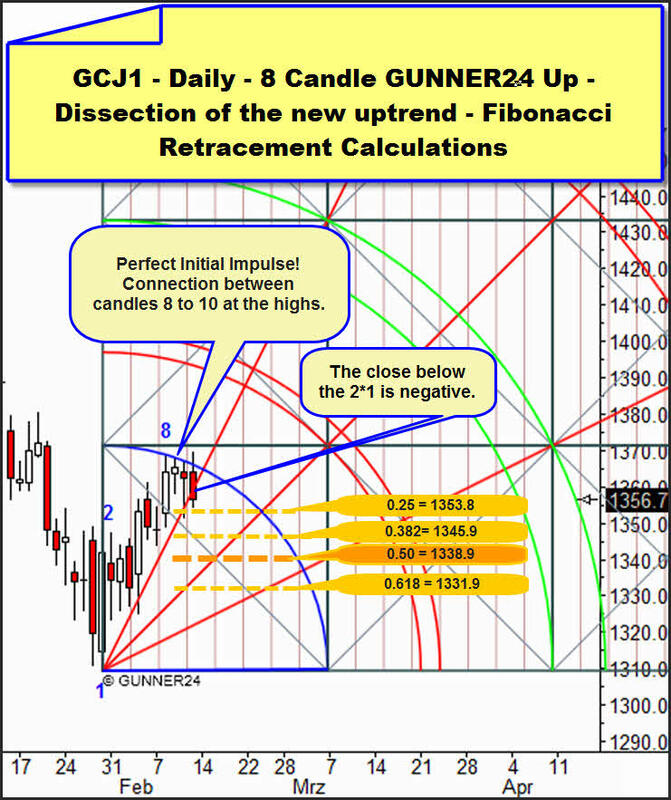 Gann Angles which should have to produce support now since they were broken upwards with the last upswing. REALLY, they should just be reached by tidbits, if ever. REALLY the 1*2 should go on providing support. If nevertheless on Monday or Tuesday a sell-off happens and all the four are broken the 28.50 will be obvious. If the resistance Gann Angle is broken being generated a closing price of more than 30.50 we’ll go long on daily basis. First target will be 31.75. Main target 37.40! Starting point is the weekly 8 Candle GUNNER24 Up Setup of the S&P 500. By the end of the week before last we went long again. Now we adjust the SL on entry because the market has arrived at 1329. That’s where there’s A) a weekly resistance, recognizable by the left setup-anchored red dotted horizontal and B) the monthly resistance we worked out in the last issue. For us, the simultaneous appearance of equal signs in different time frames means at first that we’ll have to reckon on a counter reaction to the current trend there. 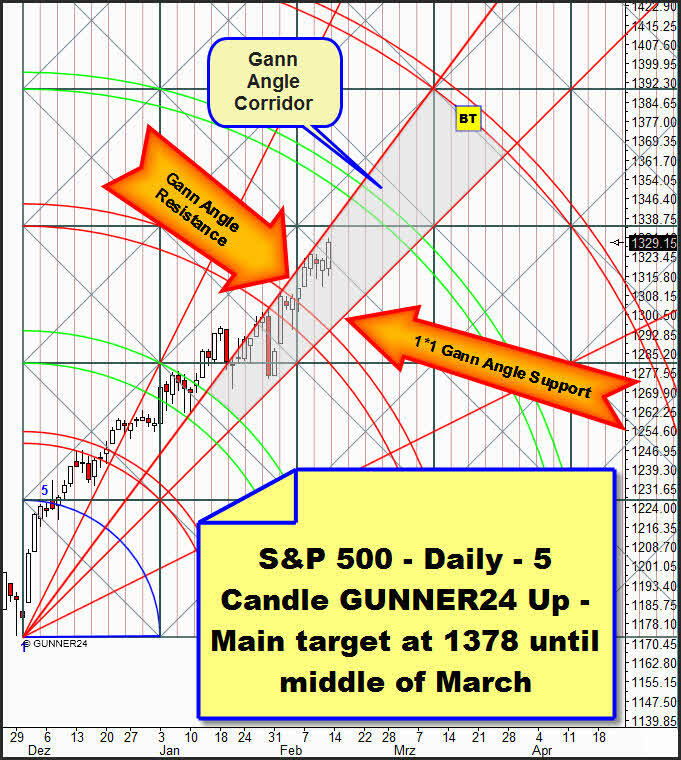 In the daily 5 Candle GUNNER24 Up Setup the market is clearly following the Gann Angle Corridor upwards (gray underlay). Since the 3rd double arc was broken the week before last now the 4th double arc is the next target for the moment. But since that one provides rather little resistance the 5th double arc should be reached relatively quickly and without any essential correction.